Thurmond is an old railroad town that sits on the New River. Settlers first started arriving in Thurmond around 1844. 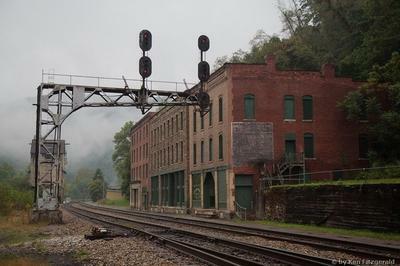 It was HIGH traffic for trains going in and out of the state of W.Va. for trading. The actual town is now open as a museum to tourist, filled with all the old buildings maintained as well as possible. There are only 4 residence that live in the town of Thurmond today. Residence claim to see people walking at night, in old 19th century clothing as well as visions of children looking out of broken windows, and noises heard from the old train stops.
. . . a foreboding looking town.